I don’t know whether I was just stepping out or stepping up. I participated in my first dance competition a day or so ago. 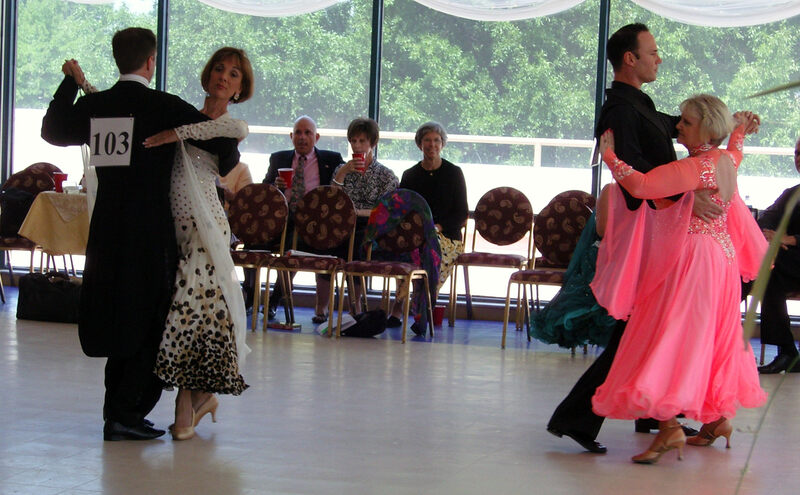 I went down to Raleigh for a small comp to do seven dances. Apparently that’s a bit unusual — doing that many dances in one’s first comp. At least that’s what some people have told me since then. 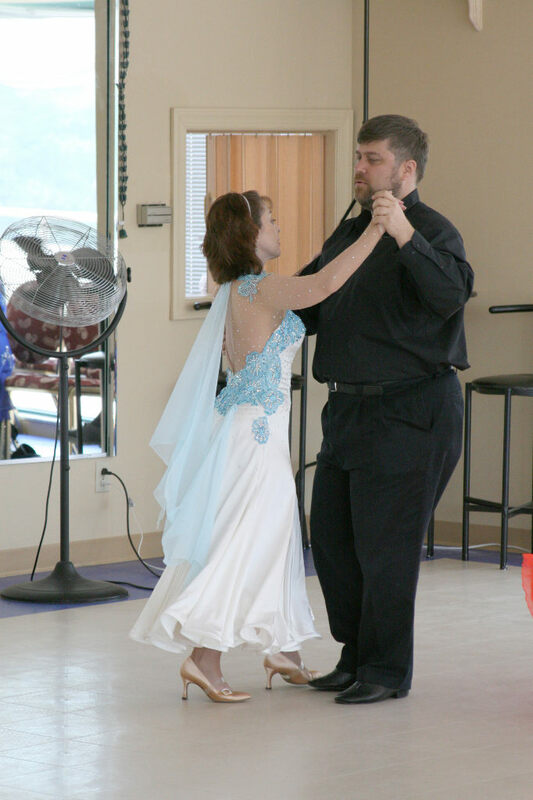 I guess maybe if someone had told me that earlier, I might stuck with only two or three dances, but we had been practicing eight in comp class and if I had not gone senile with one issue with the basic steps in East Coast swing, I probably would have entered in that as well. I still don’t know if doing seven dances for your first comp is hard or not. All I know is I did it. I figured I knew the dances so I might as well do them. It wasn’t costing me anything to try them. Well, actually, it was costing me something. $25 an entry, but why pay for the price of a hotel room, the general entry fee, gas down and back to Raleigh (about a gazillion dollars at today’s prices), and not dance as much as possible? As long as it’s taking me a day and a half and I’ve already got a lot invested, why not just do as many entries as I could? After all, what’s the point in driving that far and spending that much money to do one or two dances totaling less than 3 minutes? 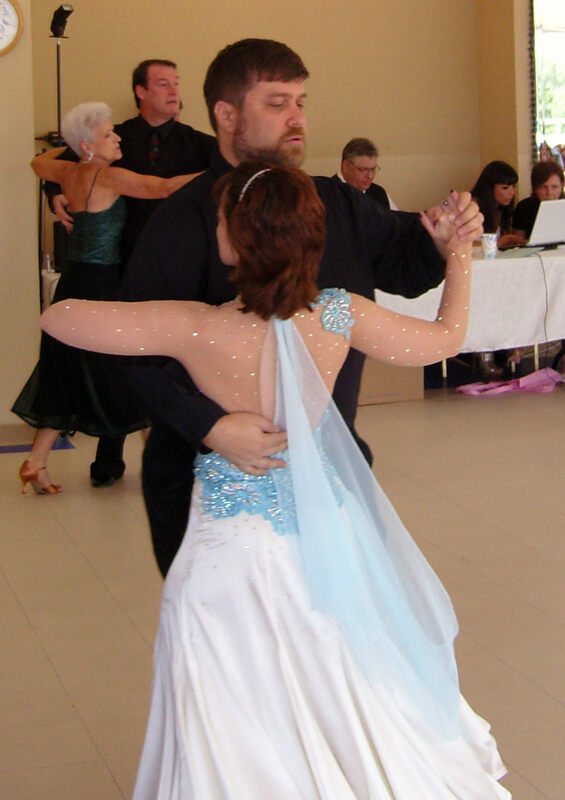 So I ended up registering as a newcomer (as in never having competed before) in tango, foxtrot, waltz, Viennese waltz, cha-cha, rumba, and bolero. To go into just what was going on when I was at the comp, I need to make two stops with the way-back machine. The first is in, as best I can figure now, the summer of 2005. I’ve already mentioned this in another entry, but it bears heavily on this, so I’ll bring it up again. 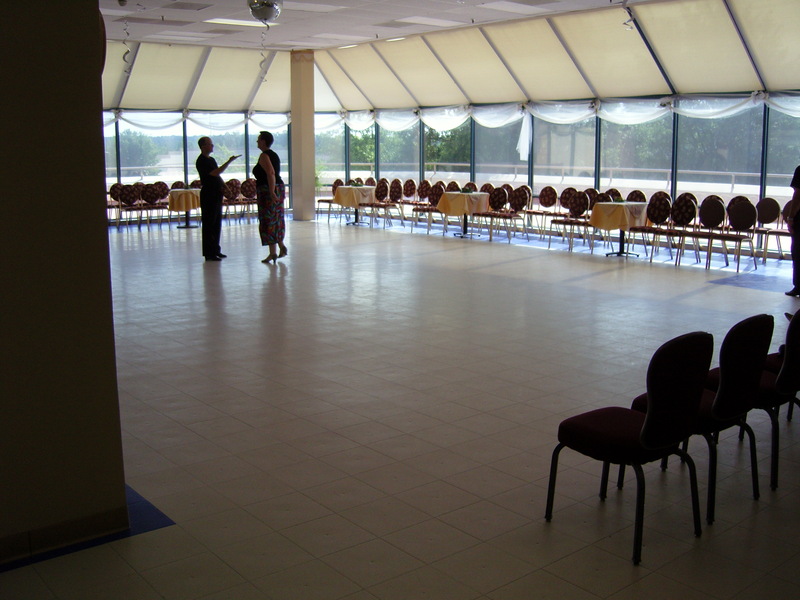 One evening I drove over to The Dancespace to try beginning ballroom dance lessons. It took me a bit to find it and by the time I did, I was running a bit late. I climbed the steps (it’s on the 2nd floor) and looked through the square window in the door, at face level. I saw a line of men, moving in what seemed like unison, as they were trying a dance step. There was a line of women watching them. Everyone seemed to know what they were doing, even though it was a beginner’s class. I’ve said I left. The truth is I bolted down the steps to make sure nobody would see me. That’s what going through kindergarten to twelfth grade in a school with the same kids constantly teasing you for your lack of coordination will do to you. Even in my 40s, there was still that kid in me that never could do anywhere near as well as the other kids in school and was terrified of trying any kind of movement in front of the others. Having teachers call me names like, “physical degenerate” in front of the entire grade didn’t help either. So I walked up the steps to a dance class, finally conquering my fears, and I see everyone moving like they knew what they were doing and I took off. I figure it was the next summer before I was finally able to go back and try it again. It took me that long to get over all those childhood and teenage images of being inept and incapable. The second stop with the way-back machine is last Wednesday. My business computer was working well after a recent RAID crash where I lost 3 out of 4 drives within minutes of each other, thus bringing the entire system down (note to self: never buy a Maxtor drive again, in this lifetime or any other). I had gotten it working again the previous week and now the last drive, the system drive, crashed (and yes, it was a Maxtor as well). The computer my whole business was based on was not working and the backups I had didn’t work as well as they should have. Then the window in my car door was rattling, requiring me to take apart the door to fix it and I had to make an unscheduled trip to Charlottesville on Thursday. Friday I was rushing to get my computer so I could at least verify I hadn’t lost data, as well as having to pull the car door apart. I was covered in grease and going back and forth, from my computer to the car and back, depending on whether the computer was working or waiting for input (and I had to continuously wash my hands over and over!). Both were taken care of, but it resulted in me leaving about 2 hours late, picking up another dancer, then getting to the hotel 2 hours late and starved. By the time I finally got to sleep, knowing I’d have to be up early the next morning, it was late, even for me. It’s my first competition and I get up for it exhausted from the past few days and can’t help remembering, as I’m getting ready to look smooth and suave, that less than 24 hours earlier I was sitting on the concrete, in grimy shorts and t-shirt, with grease splotches from the car window device all over my legs and arms. I don’t know if I clean up well, but at least I can be cleaned up. If you’ve never been to a dance comp, it’s all done in heats. In each heat they have a number of couples on the floor dancing for about 60-90 seconds. You could be competing with dancers in that heat or in other heats. 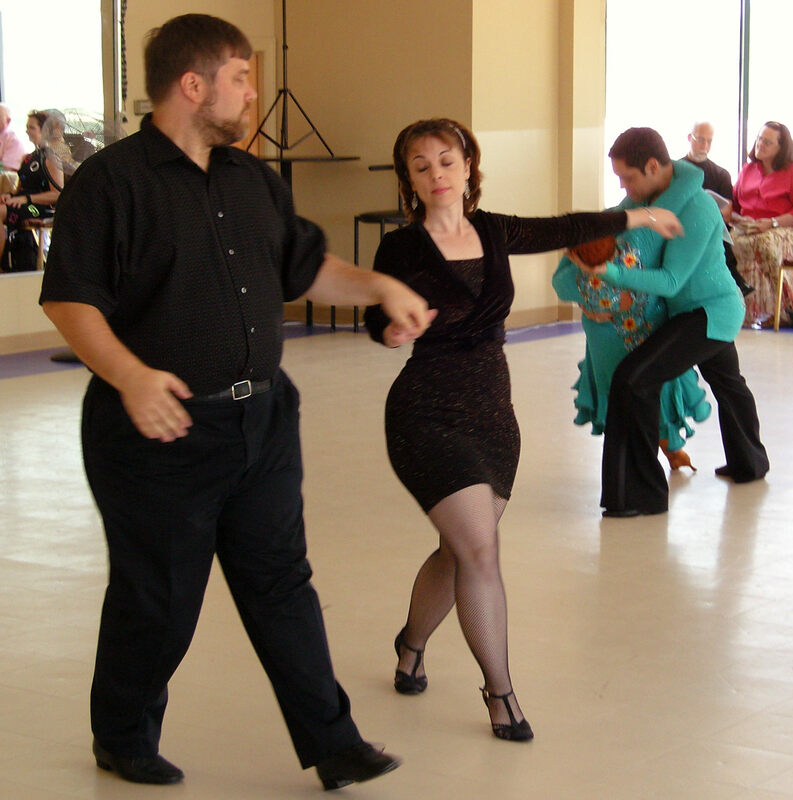 You can practice for weeks or months and it comes down to about a minute of dancing when they judge you. Sometimes you’re doing another dance in the next heat so you just stay on the dance floor for that one. If not, you leave the floor. and wait. 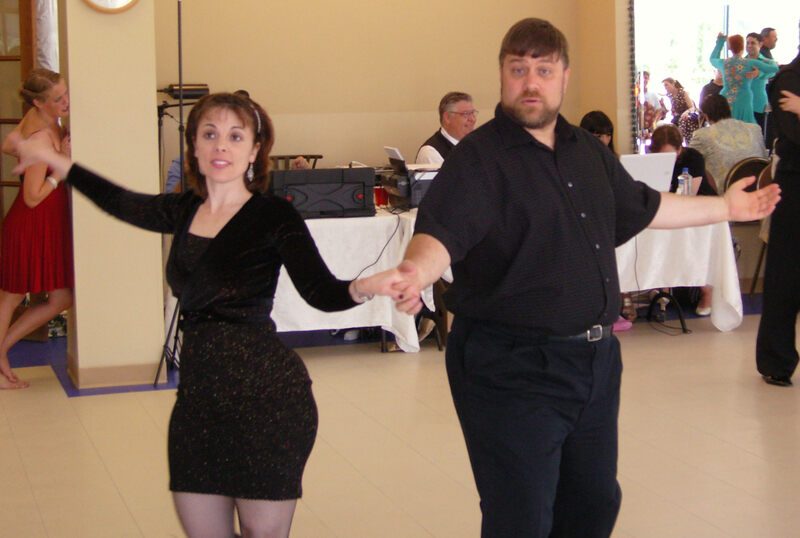 Instead of starting the dancing, the announcer says, “Just a reminder that lunch is ready in the other room so you can eat it whenever you can take a break.” My instructor looked at me and said, “Okay, I’m ready for a break,” and started to walk toward the other room. It was all I could do to keep from cracking up. For all I know, that made all the difference because right after that, I was much more comfortable and when the music started, we did a foxtrot. I wish I could say what the song was. I did notice it, but I didn’t recognize it. At least I wasn’t so nervous I didn’t know what was going on. I do know that when we did the Viennese waltz it was to a Strauss waltz, but other than the Blue Danube, they all sound the same to me. 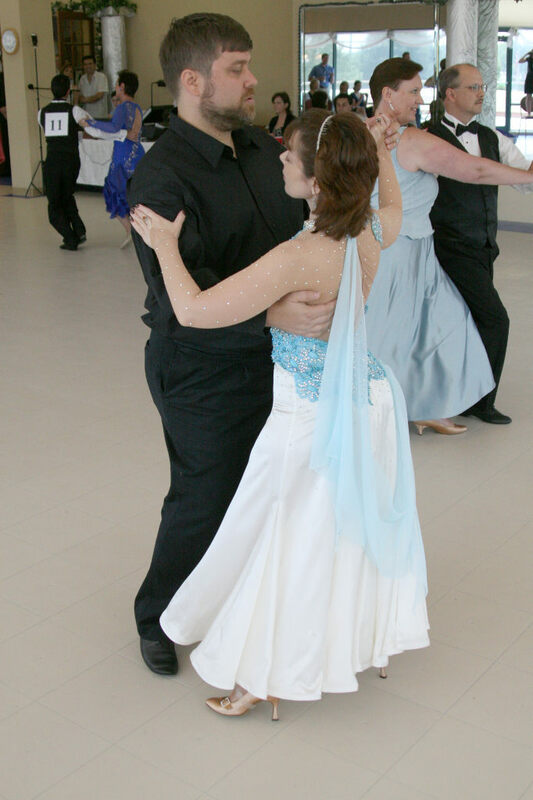 Immediately after the foxtrot, we had the waltz, then skipped one heat and did the tango, where, again, instead of starting the music once we got out there, something else was going on, leaving me to start at my instructor and stand ready to dance for somewhere around a million years, until the tango music finally started. Then it was few hours off until it was time to do the Latin dances. 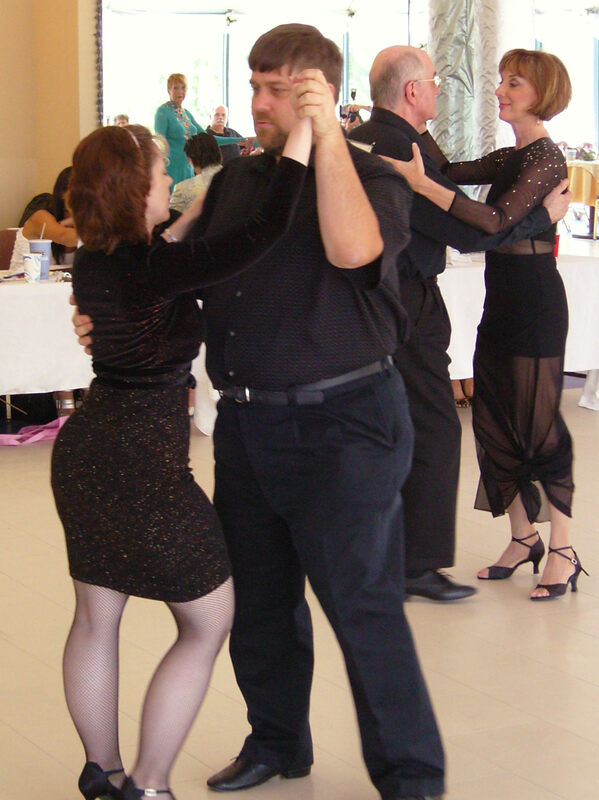 That started with the bolero, then a good break, then the cha-cha and rumba. By the time we reached the rumba, which was right after the cha-cha, I think my brain was a bit scrambled. While I haven’t taken French since high school, I was thinking in French and may have even started talking in French. 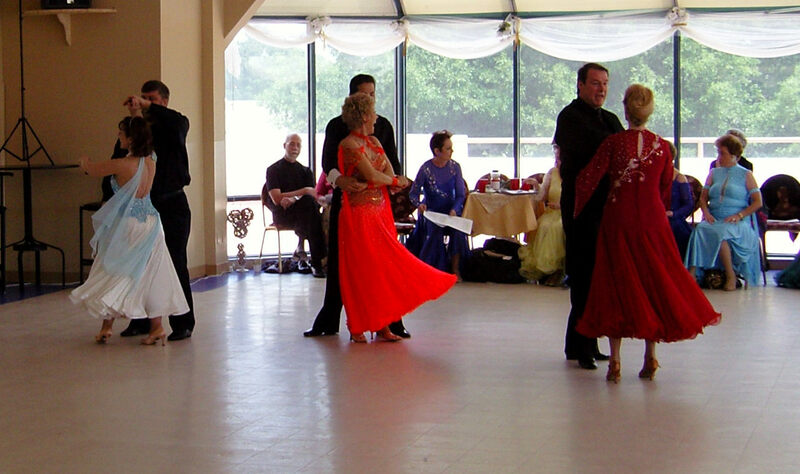 I don’t know, but I missed them saying it was the rumba and was trying to ask my instructor what we were doing. It just wasn’t straight in my head, but once the music started and I heard the slow-quick-quick beat, I knew what to do. Then, when we finished, we walked off the floor and I was about ready to just collapse. We have no idea how we’ve done until the awards, which were after dinner (which was about 45 minutes late and, of course, the awards were delayed even more). After announcing the big rewards, they announced certificates of participation. 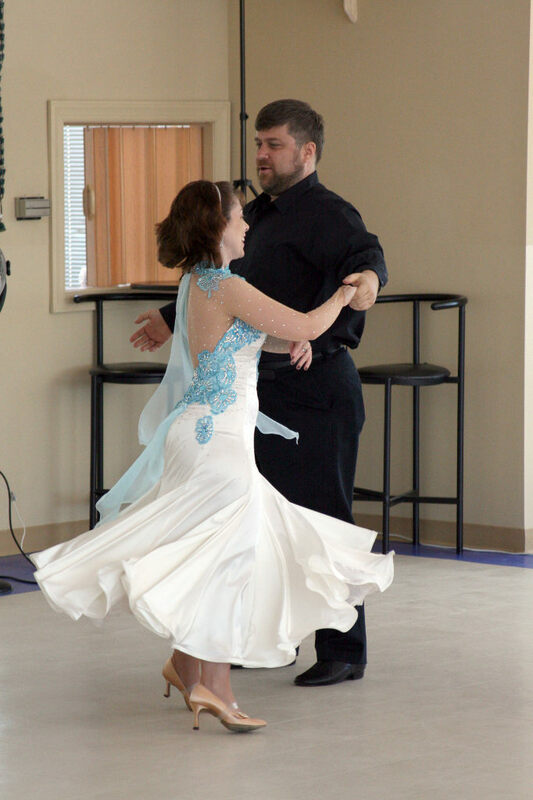 The other dancer from our studio, was called up first, then my instructor. We were surprised they called her up, since she wasn’t competing. (My heats were pro-am, with her being the pro, so I was being judged and she wasn’t.) She came back with a score sheet of all the dances she did with me and the one other dancer and I started looking at them when she pointed out one to me. I saw a box, with three columns, the first was our names, the second said, “Average Score,” and the third column said, “Place” and under that was “1.” I looked at it, wide eyed, then asked her, “Does that mean actual place as in first, second, or third? As in if it’s a one, I won?” She smiled and said, “Yes. About that time they called my name for my participation certificate and the two of us walked up to get it and my smile got bigger and bigger as it dawned on me that I really did win every single dance I did! We left soon after that, just the other dancer and I, so we could get back to Richmond. (After all, I had nobody to walk the dog that night, so I had to get back!) The poor guy! All I could think of was that first dance lesson, the one I saw through the door, and ran from. Over and over, on the drive home, I kept saying, “Damn!”, then, after another second or two, “Did I really do that?” It just would not sink in. It’s still not sinking in. I honestly don’t know what it means. I don’t know what the other dancers were like and haven’t checked to see how many I was up against (I know I was competing with several others in some dances), but my lowest average score was 94, so I must not have done too poorly. I do know it means a lot to know that the kid a teacher called a “physical degenerate” in front the entire grade did something a day ago that most of the show-offs at that school who called me names will never do: I placed first in seven different dances at my first dance comp. It’s not about revenge or proving anything to them, but I do think with as much self-improvement work I’ve done on myself, it still took that to prove something to me. 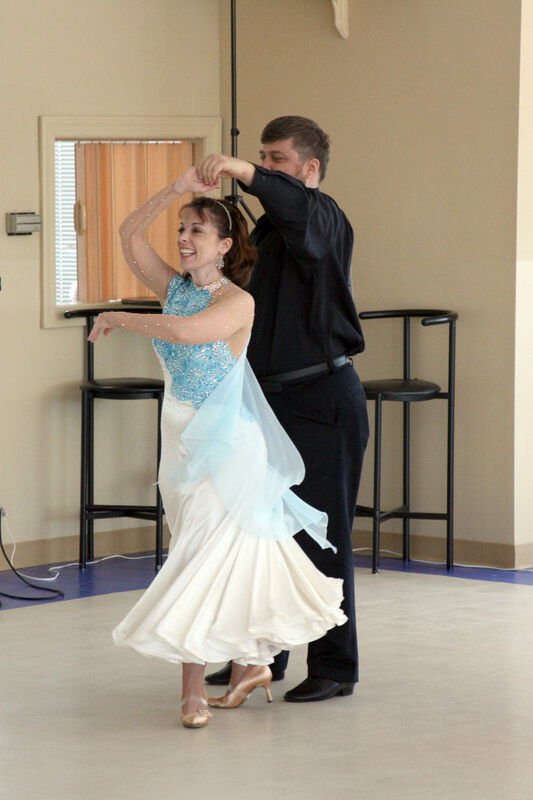 This entry was posted in Ballroom Dancing, Life, Literature and Arts. Bookmark the permalink. 1 Response to Stepping Out or Stepping Up?